“One cannot change an existing system; one must create a new system that makes the old system obsolete.” – Buckminster Fuller. Money has been called the root of all evil. It is certainly the root cause of many of the socioeconomic and ecological injustices we are facing today. Our current economic model is known as growth economics or growth capitalism. In this model nature is an externality. It is a significant biosphere stressor. In this video presentation from ScientistsWarning.TV, Stuart Scott introduces our current economic framework, known as neoclassical or limitless growth economics. Economics is the study of the allocation of scarce resources. According to the American Economic Association, “it’s the study of scarcity, the study of how people use resources and respond to incentives, or the study of decision-making. It often involves topics like wealth and finance, but it’s not all about money. Economics is a broad discipline that helps us understand historical trends, interpret today’s headlines, and make predictions about the coming years.” In terms of climate change the predictions are dire and the changes needed radical. Yet we continue to fail to connect the dots. Meanwhile, 200 species a day and countless forests fall like extinction dominoes. There are many types of monetary systems. The most common type used globally is fiat money. The US Dollar is fiat money. The current system of fiat money is informed and governed by specific b ranch of economic principles called neoclassical economics, growth economics or growth capitalism. According to Wikipedia, “neoclassical economics is an approach to economics focusing on the determination of goods, outputs, and income distributions in markets through supply and demand.” It has also been referred to as trickle-down or supply-side capitalism. This follows the theory that what’s good for the wealthy will trickle-down to everyone in the society; not that this happens. Supply-side is the opposite of Keynesian theory which conversely has demand as it’s primary driver. In laissez-faire capitalism the business sector is largely free from government intervention in their transactions, such as tariffs and regulations. In fact, most large corporations are so free from regulations of any kind that they rarely pay taxes. The fox is in charge of the proverbial hen house. Koch Brothers, other large corporate Fortune 500 interests, and oil oligarchies now control government agencies. In this video, well-known economist Richard Wolf discusses capitalism run wild. Nancy MacLean’s book, Democracy in Chains also discusses this. For more education and background on our current economic system and how it works, please visit The Great Courses. So, you might ask is the problem our capitalism or our economic policy? The problem is both. They are intertwined. 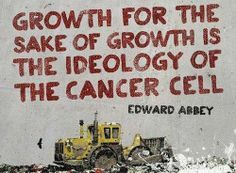 Our adoption of growth capitalism, it’s subsequent economic policy and it’s inherent neoliberalism have simply stopped working for habitat and for humanity. This system is in need of reform, revision and revolution. In mainstream economics (limitless growth economics) the entire natural world is an externalized. This means that destruction of it is not a factor, because it simply doesn’t exist on paper. Money is turning the natural world into more money as fast as it possibly can. Self-interested profiteering over all else is how the current system operates. This means it’s every man for himself and the only game in town is the bottom line. Maximizing profit must come at any cost and often does. This is just the beginning of the problem with this paradigm. For the elite ruling class there will never be enough wealth accumulated because it is after all, a limitless growth economy — never mind the finite planetary resources. In order to be the top dog in the limitless growth economy game, a rich man must always get richer, and have more than the next guy. The competition is minute to minute. It becomes an addiction. Many analysts and scholars are calling out the abuses of this corrupt capitalism now in power globally. US Senator Bernie Sanders of Vermont has spoken to the Pope about these abuses of capitalism. Additionally, Noam Chomsky (video) and Chris Hedges (video), notable scholars, authors and speakers of our time are discussing how our societal illusion of democracy is now hiding a predatory corporate totalitarianism backed by growth economics schemes. Thom Hartmann has said that the madness of the morbidly wealthy (video) we call the elite ruling class, is ruining our planet. Chris Hedges, w ho says “I don’t fight fascists because I’ll win, I fight them because they are fascists,” is calling for an overthrow of this corporate totalitarianism. Despite our inertia and complacency as a society bent on free market mythology, we must begin to find the end of this destructive, predatory installment of capitalism. Free market mythology (video) says Ralph Nader, is an educational tool which has led to this state of corporate totalitarianism. We believe that we have free market capitalism, but we do not. Many scholars and researchers are now reporting that we actually have an unhealthy, apparently undead version! According to Henry Giroux, PhD we have adopted a dysfunctional, malicious, and predatory” zombie capitalism.” He argues that in fact free markets, can and do exist without capitalism. Even though we believe that our current system is the only form of capitalism, it is not. It is a flawed interpretation that is now outdated and greatly in need of overhaul and reform at the very least. Simon Kuznets, the inventor of Gross Domestic Product (GDP), said when he presented it in the US that this should not be seen as an ultimate measure of an economics, and that later we should continue his work toward finding a more complete model. As a society, we ignored and quickly forgot this warning. Also, in the beginning there was an assumption that GDP would be used as a measure within the context of a moral compass and a larger ethical framework. However, at some point we have lost any semblance of this ethics as a society. Businesses were originally meant to serve society; with profit as a consequence of this service. But now we have this completely backwards. We must return to a core business model that is philanthropic and ecological, because after all you can’t, breathe, eat or drink money once the air, land and water are all polluted for profit. “Humans evolved within a lush and vibrant Eden teaming with life, which until just a few generations ago provided for natural abundance and the prospect of perpetual human existence. We are one of many species utterly dependent upon natural ecosystems for all needs including air, water, food, and shelter. The rise of ecological colonialism and the industrial revolution changed all that, as million year old naturally evolved ecosystems became fodder to be liquidated and consumed for accumulation of paper wealth. The disambiguation of buying our needs with money has led us to deny our ecological nature. Our notion of GDP is incomplete and dangerous. It has become extremely harmful to the biosphere we rely on for life and is now threatening us with extinction. Planned obsolescence is a good thing for GDP. But a bad thing for ecology, ecosystems and people. In short, the elite are corrupt and now have achieved unregulated and unfettered power. As we know absolute power corrupts absolutely. They are addicted to the game of money. This is similar to the psychological disorder we know as hoarding or gambling addiction at a sociopathic level. The obscenely wealthy are playing a game of monopoly with our lives and the life of the planet in order to win at an imaginary game of wealth that is only capable of being self-interested and purely profit motivated. Some have also said this is exactly what happens when you take Randian principles seriously. Milton Freidman also advanced this ideology. 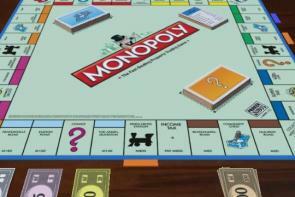 Further honest workers, countless lifeforms, and all life on earth becomes a pawn in a criminal elite monopoly game. Some have also called limitless growth the biggest ponzy scheme on the planet. Amazon, for example, is now similar to a nation-state controlling global interests. Jeff Bezos could end world hunger (video), says Jimmy Dore and yet Amazon employees need to work multiple jobs, are often forced to apply for food assistance from the public and cannot access healthcare in the country where they live and work. The only question remaining is what’s next, reform or revolution? Many say start with reform. Climate change is a direct result of how our current model of capitalism fails to value nature. Worldwide impacts of anthropogenic climate disaster continue to intensify, corporations and the global elite continue to plunder our planet, subjecting areas of the planet that already face tragedy to still greater risks. 5) and; present sustainable leaders to the world that serve as steward’s of the biosphere. What About the Green New Deal (GND)? Many are now turning to the Green New Deal to bring change. Many others are still skeptical. The Green New Deal (GND) — a term purposefully reminiscent of Franklin Roosevelt’s original New Deal in the 1930s, has gained a lot of following by progressives. It refers, in the loosest sense, to a massive program of investments in clean-energy jobs and infrastructure, meant to transform not just the energy sector, but the entire economy. It is meant both to decarbonize the economy and to make it a fairer and more just society by addressing healthcare and education related concerns. It may be a step in the right direction, but critics are already saying we are going to need stronger reform than this to get off of fossil fuels and save the future. One critical question is why doesn’t it push for a carbon tax? Critics are already saying it will be too little, too late. Still, most agree that it would be better than where we are now. In this video discussing the Green New Deal (video) Tom Goldtooth of Indigenous Environmental Network says “the earth, air and water have rights too.” Tom Goldtooth also says that a Green New Deal must reject corporate takeover and rather, center on indigenous and front line communities. Many groups are now beginning to back the GND. There is also of course a downside. Since the carbon tax was introduced, wholesale electricity prices in the National Electricity market have increased significantly. In some countries, like Australia, it resulted in the largest energy corporations in the oil oligarchy offsetting the bill to regular folks that forced many out of their housing, while these corporations continued to receive subsidies and tax breaks. The Energy Users Association of Australia in its June 2013 paper said that electricity generators have been able to pass through more than 100% of the cost of the carbon tax. It was repealed in 2014 due to failure. Other countries that have a carbon tax include Norway, Sweden, Canada and others. Perhaps at the very least the increased costs to consumers will stimulate and incentivize the choice to go off grid or choose alternatives like wind and solar. Ecological economics has long been touted as an antidote to growthism. Many are discussing an ecological civilization that would put in place an economic model based on ecological principles. In this economics the goal would be to take scarce resources, which must be protected, and allocate them to create well-being for society and the biosphere we live in. This is the true basis of genuine sustainability ethics. This would elevate nature over profit. There are many forms of this such as socialistic capitalism, natural capitalism, and even some completely currency free paradigms now being debated. Adopting this model across many platforms could lead to a real revolution. Many aspects could be put in place immediately. In fact, some groups and nations are already using these principles. We should study GNH as the Bhutan model has long shown success with. Ultimately, we will need to end our addiction to a growth economy and choose a new ecological and sustainable model despite our current society’s inertia, fear of change, and addiction if we are to survive. It is clear that it is time to either reform or revolutionize our monetary and economic systems. We cannot continue with business as usual and we must relinquish GDP and neoclassical economics. We are not moving fast enough, but the first foundations for the potential for fundamental shifts are now beginning to appear. Pressure from a large range of stakeholders, including businesses themselves are arising. It is now clear to many that we have a burning platform seeking reform. Business, trade, economy are at the heart of this matter. We can’t transform without businesses, regulation, legislation and systemic action from the top down. Of course, we must also work from the bottom up to change how we consume and decrease our demand for stuff. As political commentator and comedian Jimmy Dore recently said on his progressive show, “we need a real revolution” (video). The current economic system must be reformed or revolutionized before we lose our biosphere and thus our habitat. Simply put, we must end our addiction to growth before it ends us. Giroux, Henry (2014). Zombie politics and culture in the age of casino capitalism…2nd ed [Book]. New York, NY: Peter Lang Inc.
Hedges, Chris (2018). America the farewell tour [Book]. New York, NY: Simon & Schuster, Inc. Lawn, Philip (2016). Resolving the climate change crisis: The ecological economics of climate change [Book]. Netherlands: Springer. McLean, Nancy (2017). Democracy in Chains…[Book]. New York, NY: Penguin. 4:35 pm Jan. 20, 2019 – Shani Cairns – (Updated and edited content and references). 2:00 pm Jan. 17, 2019 – Charles Gregoire – (Reviewed the page and fixed up small typing errors). 1:35 pm Jan. 16, 2019 – Shani Cairns – (Added Economics 101 References and History Sections and updated content). 7:15 pm Jan. 02, 2019 – Shani Cairns – (Added Economics 101 content write up and section content). Note: This page is in a very early draft stage and as with many wiki pages, it is a work in progress. It aims to introduce the concepts and problems with mainstream economics 101 and business as usual. This thinking represents a return to sanity!